Ÿ The Notes are designed for investors seeking exposure to a “covered call” strategy, as represented by the CBOE DJIA BuyWrite Index (index symbol “BXD”SM) (the “CBOE Index”), who wish to receive current income in the form of monthly payments at a rate of 8% per annum of the $10 original public offering price and are willing to risk losing a significant portion of the $10 original public offering price if the level of the CBOE Index does not increase significantly over the term of the Notes. Ÿ The CBOE Index tracks the performance of a hypothetical “covered call” strategy on the Dow Jones Industrial AverageSM by reflecting dividends and certain price changes of the stocks comprising the Dow Jones Industrial Average and the option premiums received from the sale of at or slightly out of the money monthly call options on the Dow Jones Industrial Average. Ÿ The return on the Notes will be based upon the percentage change in the level of the “Reference Index”, an index that tracks an adjusted performance of the CBOE Index, over the term of the Notes. The level of the Reference Index will be based upon the daily percentage change in the level of the CBOE Index as reduced (i) daily, by a Reference Index adjustment factor of 1.5% per annum and (ii) monthly, by a monthly payment adjustment amount of 8.081% per annum of the initial Reference Index level, each calculated and deducted as described in this pricing supplement. The level of the Reference Index will be set to 100 on the date the Notes are priced for initial sale to the public and will be calculated and published daily by the American Stock Exchange under the trading symbol “BWRIN”. Ÿ We will make monthly payments on the Notes at a rate of 8% per annum of the $10 original public offering price per unit as described in this pricing supplement beginning in December 2005, to but excluding, the month in which the maturity date occurs. These monthly payments will be derived from the monthly reduction of the level of the Reference Index by the monthly payment adjustment amount, and thus from the reduction of the amount payable to you on the maturity date or upon exchange or early redemption. Ÿ You may exchange your Notes prior to the maturity date during a specified period in October of each year from 2006 through 2009 for an exchange amount calculated as described in this pricing supplement. Ÿ We will redeem the Notes, for a redemption amount described in this pricing supplement, prior to the maturity date if on any trading day the level of the Reference Index is equal to or less than 20. Ÿ The Notes will be senior unsecured debt securities of Merrill Lynch & Co., Inc. and part of a series entitled “Medium-Term Notes, Series C”. The Notes will have the CUSIP No. .
Ÿ We have applied to have the Notes listed on the American Stock Exchange under the trading symbol “BWR”. If approval of this application is granted, the Notes will be listed on the American Stock Exchange at the time of such approval. We make no representation, however, that the Notes will be listed or, if listed, will remain listed for the entire term of the Notes. Ÿ The settlement date for the Notes is expected to be November , 2005. Ÿ You are not guaranteed to be repaid a fixed amount of principal on the Notes. On the maturity date or upon exchange or early redemption you will receive a cash amount per unit based upon the percentage change in the level of the Reference Index over the term of the Notes. Ÿ Due to the reduction of the level of the Reference Index by the Reference Index adjustment factor of 1.5% per annum and the monthly payment adjustment amount of 8.081% per annum of the initial Reference Index level, the level of the CBOE Index must increase significantly over the term of the Notes in order for you to receive at least the $10 original public offering price per unit on the maturity date or upon exchange or early redemption. If the level of the CBOE Index decreases or does not increase sufficiently over the term of the Notes, you will receive less, and possibly significantly less, than the $10 original public offering price per unit. Information included in this pricing supplement supercedes information in the accompanying prospectus supplement and prospectus to the extent that it is different from that information. Investing in the Notes involves risks that are described in the “ Risk Factors” section beginning on page PS-8 of this pricing supplement and in the accompanying prospectus supplement. Proceeds, before expenses, to Merrill Lynch & Co., Inc.
(1) The public offering price and the underwriting fee for any single transaction to purchase between 100,000 to 299,999 units will be $9.95 per unit and $.15 per unit, respectively, for any single transaction to purchase between 300,000 units to 499,999 will be $9.90 per unit and $.10 per unit, respectively and for any single transaction to purchase 500,000 units or more will be $9.85 per unit and $.05 per unit respectively. * $.10 per unit of the underwriting fee will be paid to the underwriter by a subsidiary of Merrill Lynch & Co., Inc. For a description of this payment, please see the section entitled “Supplemental Plan of Distribution” in this pricing supplement. Neither the Securities and Exchange Commission nor any state securities commission has approved or disapproved of these securities or determined if this pricing supplement or the accompanying prospectus supplement and prospectus is truthful or complete. Any representation to the contrary is a criminal offense. The date of this pricing supplement is November , 2005. “Strategic Return Notes” is a registered mark of Merrill Lynch & Co., Inc.
“Dow Jones”, “Dow Jones Industrial AverageSM” and “DJIASM” are service marks of Dow Jones & Company, Inc. and have been licensed for use for certain purposes by Merrill Lynch, Pierce, Fenner & Smith Incorporated. The Notes are not sponsored, endorsed, sold or promoted by Dow Jones. “BXD” is a service mark, “Chicago Board Options Exchange” and “CBOE” are registered marks and “CBOE DJIA BuyWrite Index” is a mark, of the Chicago Board Options Exchange. These marks have been licensed for use by Merrill Lynch, Pierce, Fenner & Smith Incorporated and Merrill Lynch & Co., Inc. This summary includes questions and answers that highlight selected information from this pricing supplement and the accompanying prospectus supplement and prospectus to help you understand the 8% Monthly Income Strategic Return Notes® Linked to the CBOE DJIA BuyWrite Index due November , 2010 (the “Notes”). You should carefully read this pricing supplement and the accompanying prospectus supplement and prospectus to fully understand the terms of the Notes, the Reference Index (as defined below), the CBOE DJIA BuyWrite Index (the “CBOE Index”) and the tax and other considerations that are important to you in making a decision about whether to invest in the Notes. You should carefully review the “Risk Factors” sections in this pricing supplement and the accompanying prospectus supplement, which highlight certain risks associated with an investment in the Notes, to determine whether an investment in the Notes is appropriate for you. References in this pricing supplement to “ML&Co.”, “we”, “us” and “our” are to Merrill Lynch & Co., Inc., and references to “MLPF&S” are to Merrill Lynch, Pierce, Fenner & Smith Incorporated. The Notes will be part of a series of senior debt securities issued by ML&Co. entitled “Medium- Term Notes, Series C” and will not be secured by collateral. The Notes will rank equally with all of our other unsecured and unsubordinated debt. The Notes will mature on November , 2010, unless previously exchanged by you or redeemed by us as described in this pricing supplement. Each unit will represent a single Note with a $10 original public offering price. You may transfer the Notes only in whole units. You will not have the right to receive physical certificates evidencing your ownership except under limited circumstances. Instead, we will issue the Notes in the form of a global certificate, which will be held by The Depository Trust Company, also known as DTC, or its nominee. Direct and indirect participants in DTC will record your ownership of the Notes. You should refer to the section entitled “Description of the Debt Securities—Depositary” in the accompanying prospectus. Are there any risks associated with my investment? Yes, an investment in the Notes is subject to risks, including the risk of loss. Please refer to the section entitled “Risk Factors” in this pricing supplement and the accompanying prospectus supplement. What is the Reference Index? The “Reference Index” is designed to track an adjusted performance of the CBOE Index over the term of the Notes. The level of the Reference Index will be based upon the daily percentage change in the level of the CBOE Index as reduced by (i) a Reference Index adjustment factor of 1.5% per annum (the “Reference Index Adjustment Factor”), deducted daily on the basis of an actual 365-day year, and (ii) a monthly payment adjustment amount of 8.081% per annum of the initial Reference Index level (the “Monthly Payment Adjustment Amount”), deducted monthly on the basis of a 360-day year of twelve 30-day months. The level of the Reference Index will be set to 100 on the date the Notes are priced for initial sale to the public (the “Pricing Date”) and will be calculated and published daily by the American Stock Exchange (the “AMEX”) under the trading symbol “BWRIN”. For more information about the Reference Index, please see the section entitled “The Reference Index” in this pricing supplement. Who publishes the CBOE Index and what does the CBOE Index measure? “DJIA”) by reflecting dividends and certain price changes of the stocks comprising the DJIA and the option premiums received from the sale of at or slightly out of the money monthly call options on the DJIA. This “covered call” strategy provides income from option premiums received from the sale (or writing) of the call options, which helps, to a limited extent, to offset losses if there is a decline in the level of the DJIA. However, this strategy limits participation in any appreciation of the DJIA beyond the options’ exercise prices. Thus, in a period of significant stock market increases, this “covered call” strategy will tend to produce lower returns than ownership of a direct investment in the DJIA. For more information on the CBOE Index, please see the section entitled “The CBOE Index” in this pricing supplement. The Notes are debt obligations of ML&Co. An investment in the Notes does not entitle you to any dividends, voting rights, option premiums or any other ownership interest in the securities included in the CBOE Index. How have the Reference Index and the CBOE Index performed historically? The Reference Index will not exist until the Pricing Date. We have, however, included a table and a graph showing hypothetical historical levels of the Reference Index on the last business day of each month from September 2000 through August 2005 based upon historical levels of the CBOE Index and a Reference Index level of 100 set as of September 18, 2000. Please see the section entitled “The Reference Index—Hypothetical Historical Data on the Reference Index” in this pricing supplement. The level of the CBOE Index was set to 100 on October 16, 1997. On September 15, 2005, the closing level of the CBOE Index was 166.11. We have included a graph showing the historical year-end closing levels of the CBOE Index and the annual percentage increase or decrease of the CBOE Index for each year from 1997 through 2004. We have also included a table and a graph showing the historical month-end closing levels of the CBOE Index from January 2000 through August 2005. Please see the section entitled “The CBOE Index—Historical Data on the CBOE Index” in this pricing supplement. 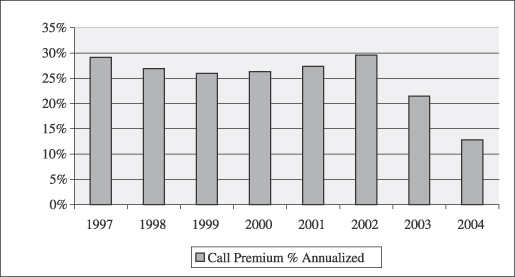 In addition, we have included a graph showing the historical annual average percentage returns resulting from option premiums that would have been received from the sale of monthly call options on the DJIA, for each year from 1997 to 2004 in the section entitled “The CBOE Index—Historical Average Percentage Returns—DJIA Call Option Premiums” in this pricing supplement. We have provided this hypothetical historical information on the Reference Index and this historical information on the CBOE Index to help you evaluate the behavior of these indices in various economic environments; however, past performance is not necessarily indicative of how these indices will perform in the future. What will I receive on the maturity date of the Notes? On the maturity date, if you have not previously exchanged or if we have not previously redeemed your Notes, you will receive a cash amount per unit equal to the Redemption Amount. The “Starting Value” will be set to 100 on the Pricing Date. Events” in this pricing supplement. Because the Ending Value is calculated as described above, the Reference Index will not be reduced by the Monthly Payment Adjustment Amount during the final month of the term of the Notes. The level of the Reference Index will be reduced daily by the Reference Index Adjustment Factor of 1.5% per annum, and monthly by the Monthly Payment Adjustment Amount of 8.081% per annum of the initial Reference Index level. As a result of these reductions, the level of the CBOE Index must increase significantly over the term of the Notes in order for the level of the Reference Index to increase sufficiently for you to receive at least the $10 original public offering price per unit on the maturity date, exchange date or early redemption date, as applicable. If the level of the CBOE Index and therefore, the Reference Index, decreases or does not increase sufficiently over the term of the Notes, you will receive less, and possibly significantly less, than the $10 original public offering price per unit. See the section entitled “Risk Factors—Your investment may result in a loss” in this pricing supplement. For more specific information about the Redemption Amount, please see the section entitled “Description of the Notes—Payment on the Maturity Date” in this pricing supplement. Will I receive monthly payments on the Notes? Monthly payments on the Notes will accrue at the rate of 8% per annum on the $10 original public offering price per unit from and including November , 2005 or from the most recent monthly payment date for which monthly payments have been paid or provided for. No monthly payment will accrue, or be paid, during the final month of the term of the Notes. You will receive monthly payments on the seventh Banking Business Day (as defined in this pricing supplement) following the date the Monthly Payment Adjustment Amount is deducted from the Reference Index level, which date will be the first Trading Day of each month, beginning December , 2005, to but excluding the month in which the maturity date occurs. If any monthly payment date is not a Banking Business Day, you will receive payment of any accrued and unpaid monthly payments on the following Banking Business Day. These monthly payments will be derived from the monthly reduction of the level of the Reference Index by the Monthly Payment Adjustment Amount, as discussed above. As a result, by investing in the Notes, you will receive current monthly income in exchange for a reduction of the level of the Reference Index, and thus a reduction of the amount that you will receive on the maturity date, exchange date or early redemption date, as applicable. For more specific information about the monthly payments on the Notes, please see the section entitled “Description of the Notes—Monthly Payments on the Notes” in this pricing supplement. You may elect to exchange all or a portion of your Notes during a specified period in the month of October of each year from 2006 through 2009 by giving notice to the depositary or trustee of the Notes, as the case may be, as described in this pricing supplement. Upon exchange, you will receive a cash amount per unit equal to the Redemption Amount, calculated using an Ending Value equal to the level of the Reference Index on the exchange date (the “Exchange Amount”). The Exchange Amount will be paid on the third Banking Business Day following the exchange date. If you elect to exchange your Notes, you will receive only the Exchange Amount and you will not receive the Redemption Amount on the maturity date. The Exchange Amount you receive may be greater than or less than the Redemption Amount on the maturity date depending upon the performance of the CBOE Index and the related performance of the Reference Index during the period from the exchange date until the maturity date. For more specific information about the exchange feature, please see the section entitled “Description of the Notes—Exchange of the Notes Prior to the Maturity Date” in this pricing supplement. How does the early redemption feature work? of the Reference Index is equal to or less than 20, the Notes will be redeemed by us on the fifth Banking Business Day following that date. 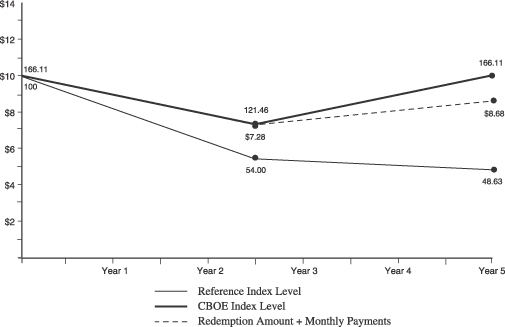 In the event of an early redemption, you will receive a cash amount per unit equal to the Redemption Amount, calculated using an Ending Value equal to the average of the closing levels of the Reference Index on the two Trading Days immediately succeeding the Trading Day on which the closing level of the Reference Index was equal to or less than 20 (the “Early Redemption Amount”). 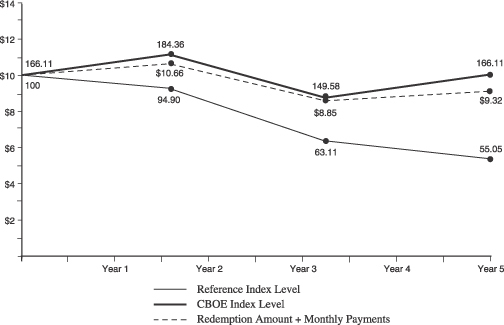 For more specific information about the early redemption feature, please see the section entitled “Description of the Notes—Early Redemption” in this pricing supplement. The United States federal income tax consequences of an investment in the Notes are complex and uncertain. By purchasing a Note, you and ML&Co. agree, in the absence of an administrative determination, judicial ruling or other authoritative guidance to the contrary, to characterize a Note for all tax purposes as an investment unit consisting of a debt instrument of ML&Co. 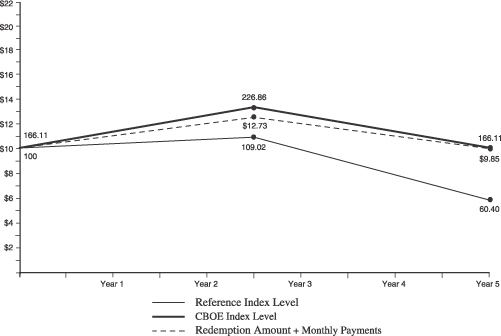 and a cash-settled forward contract linked to the level of the Reference Index. Under this characterization of the Notes, for United States federal income tax purposes, you will generally include payments of interest on the Notes in income in accordance with your regular method of tax accounting. You should review the discussion under the section entitled “United States Federal Income Taxation” in this pricing supplement. Will the Notes be listed on a stock exchange? We have applied to have the Notes listed on the AMEX under the trading symbol “BWR”. If approval of this application is granted, the Notes will be listed on the AMEX at the time of such approval. We make no representation, however, that the Notes will be listed on the AMEX, or if listed, will remain listed for the entire term of the Notes. The listing of the Notes on the AMEX will not necessarily ensure that a liquid trading market will be available for the Notes. You should review the section entitled “Risk Factors—There may be an uncertain trading market for the Notes and the market price you may receive or be quoted for your Notes on a date prior to the stated maturity date will be affected by this and other important factors including our costs of developing, hedging and distributing the Notes” in this pricing supplement. What price can I expect to receive if I sell the Notes prior to the stated maturity date? In determining the economic terms of the Notes, and consequently the potential return on the Notes, a number of factors are taken into account. Among these factors are certain costs associated with creating, hedging and offering the Notes. In structuring the economic terms of the Notes, we seek to provide investors with what we believe to be commercially reasonable terms and to provide MLPF&S with compensation for its services in developing the Notes. If you sell your Notes prior to the stated maturity date, you will receive a price determined by market conditions for the Notes. This price may be influenced by many factors, such as interest rates, volatility and the current levels of the Reference Index and CBOE Index. In addition, the price, if any, at which you could sell your Notes in a secondary market transaction is expected to be affected by the factors that we considered in setting the economic terms of the Notes, namely the underwriting discount paid in respect of the Notes and other costs associated with the Notes, including compensation for developing and hedging the product. Depending on the impact of these factors, you may receive significantly less than the $10 original public offering price per unit of your Notes if sold before the stated maturity date. In a situation where there had been no movement in the level of the Reference Index and no changes in the market conditions from those existing on the date of this pricing supplement, the price, if any, at which you could sell your Notes in a secondary market transaction is expected to be lower than the $10 original public offering price per unit. This is due to, among other things, our costs of developing, hedging and distributing the Notes. Any potential purchasers for your Notes in the secondary market are unlikely to consider these factors. What is the role of MLPF&S? Our subsidiary MLPF&S is the underwriter for the offering and sale of the Notes. After the initial offering, MLPF&S currently intends to buy and sell Notes to create a secondary market for holders of the Notes, and may stabilize or maintain the market price of the Notes during their initial distribution. However, MLPF&S will not be obligated to engage in any of these market activities or continue them once it has started. MLPF&S will also be our agent for purposes of calculating, among other things, the Redemption Amount, Exchange Amount or Early Redemption Amount, as applicable. Under certain circumstances, these duties could result in a conflict of interest between MLPF&S as our subsidiary and its responsibilities as calculation agent. Merrill Lynch & Co., Inc. is a holding company with various subsidiaries and affiliated companies that provide investment, financing, insurance and related services on a global basis. For information about ML&Co., see the section entitled “Merrill Lynch & Co., Inc.” in the accompanying prospectus. You should also read other documents ML&Co. has filed with the Securities and Exchange Commission, which you can find by referring to the section entitled “Where You Can Find More Information” in the accompanying prospectus. Your investment in the Notes will involve risks. You should carefully consider the following discussion of risks and the discussion of risks included in the accompanying prospectus supplement before deciding whether an investment in the Notes is suitable for you. We will not repay you a fixed amount of principal on the Notes on the maturity date or upon exchange or early redemption. The payment on the Notes you receive will depend on the change in the level of the Reference Index. Because the level of the CBOE Index (and therefore the Reference Index) is subject to market fluctuations and because of other factors described below, the payment on the Notes you receive on the maturity date or upon exchange or early redemption may be less, and possibly significantly less, than the $10 original public offering price per unit of the Notes. Because the level of the Reference Index will be reduced daily by the Reference Index Adjustment Factor of 1.5% per annum and monthly by the Monthly Payment Adjustment Amount of 8.081% per annum of the initial Reference Index level, the level of the CBOE Index must increase significantly in order for the level of the Reference Index to increase sufficiently for you to receive at least the $10 original public offering price per unit on the maturity date or upon exchange or early redemption. In addition, if on any Trading Day before the Calculation Period the level of the Reference Index is equal to or less than 20, the Notes will be subject to early redemption and you will receive the Early Redemption Amount. This amount would be significantly less than the $10 original public offering price per unit. The ultimate effect that the Monthly Payment Adjustment Amount will have on the level of the Reference Index, and thus, the cash amount that you receive on the maturity date, exchange date or early redemption date, will depend on the performance of the CBOE Index and, in particular, on the direction, magnitude, timing and duration of the changes in the level of the CBOE Index. If the level of the CBOE Index decreases significantly, and particularly if that decrease occurs early in the term of the Notes and is of a significant duration, the negative effect on the level of the Reference Index will be magnified by the Monthly Payment Adjustment Amount. For examples of how the level of the Reference Index is impacted by different changes in the level of the CBOE Index, see the section entitled “The Reference Index—Hypothetical Reference Index Calculations” in this pricing supplement. The yield that you will receive on your Notes, which could be negative, may be less than the return you could earn on other investments. Your yield may be less than the yield you would earn if you bought a traditional interest bearing debt security of ML&Co. with the same stated maturity date. Your investment may not reflect the full opportunity cost to you when you take into account factors that affect the time value of money. Unlike traditional interest bearing debt securities, the Notes do not guarantee the return of a principal amount on the maturity date. call options on the DJIA will be incorporated into the CBOE Index, and those amounts will then be subject to the price movements of the DJIA and the call options on the DJIA. Because of the deemed sale of call options, the level of the CBOE Index will not reflect increases in the level of the DJIA above the exercise price applicable to any month. Although we will make monthly payments on the Notes at a rate of 8% per annum of the $10 original public offering price, these monthly payments are a result of the monthly reduction of the level of the Reference Index due to the deduction of the Monthly Payment Adjustment Amount of 8.081% per annum of the initial Reference Index level. In addition, the level of the Reference Index will be reduced daily by the Reference Index Adjustment Factor of 1.5% per annum. As a result of these factors, the return on an investment in the Notes is expected to be less than the return on an investment linked solely to the level of the CBOE Index. The trading value of the Notes and final return on the Notes may also differ from the results of the CBOE Index for the reasons discussed below under “—Changes in our credit ratings may affect the trading value of the Notes”. Because the exercise price of each call option on the DJIA limits any appreciation in the level of the DJIA to the amount by which the exercise price exceeds the level of the DJIA at the time the call option is priced, the CBOE Index (and therefore, the Reference Index) will participate in little or no appreciation of the DJIA . If the level of the DJIA increases by an amount greater than the amount by which the exercise price exceeds the level of the DJIA at the time the call option is priced, the level of the CBOE Index will be less than it would be if it reflected a direct investment in the DJIA. However, although the exercise price of the call options limit your participation in any appreciation in the DJIA, exposure to any decline in the level of the DJIA will not be limited. We will redeem the Notes prior to their stated maturity date if on any Trading Day before the Calculation Period the level of the Reference Index is equal to or less than 20. In this event, you would receive an Early Redemption Amount that is significantly less than the $10 original public offering price per unit; you would not participate in any subsequent increases in the level of the Reference Index; and the monthly payments on the Notes would cease to accrue. We have applied to have the Notes listed on the AMEX under the trading symbol “BWR”. If approval of this application is granted, the Notes will be listed on the AMEX at the time of such approval. We make no representation, however, that the Notes will be listed on the AMEX or, if listed, will remain listed for the entire term of the Notes. The listing of the Notes on the AMEX does not ensure that a trading market will develop for the Notes. While there have been a number of issuances of series of Strategic Return Notes, trading volumes have varied historically from one series to another and it is therefore impossible to predict how the Notes will trade. If a trading market does develop, there can be no assurance that there will be liquidity in the trading market. The development of a trading market for the Notes will depend on our financial performance and other factors, including changes in the level of the CBOE Index. If the trading market for the Notes is limited, there may be a limited number of buyers for your Notes which may affect the price you receive if you do not wish to hold your investment until the stated maturity date. Notes, including compensation for developing and hedging the product. This quoted price could be higher or lower than the original public offering price. MLPF&S is not obligated to make a market in the Notes. Assuming there is no change in the level of the Reference Index and no change in market conditions or any other relevant factors, the price at which a purchaser (which may include MLPF&S) might be willing to purchase your Notes in a secondary market transaction is expected to be lower than the $10 original public offering price per unit. This is due to, among other things, the fact that the $10 original public offering price per unit included, and secondary market prices are likely to exclude, underwriting discount paid with respect to, and the developing and hedging costs associated with, the Notes. The trading value of the Notes will be affected by factors that interrelate in complex ways. The effect of one factor may offset the increase in the trading value of the Notes caused by another factor and the effect of one factor may exacerbate the decrease in the trading value of the Notes caused by another factor. The following paragraphs describe the expected impact on the trading value of the Notes given a change in a specific factor, assuming all other conditions remain constant. Changes in the volatility of the DJIA and the CBOE Index are expected to affect the trading value of the Notes. Volatility is the term used to describe the size and frequency of price and/or market fluctuations. If the volatility of the DJIA and/or the CBOE Index increase or decrease, the trading value of the Notes may be adversely affected. Changes in dividend yields on the stocks included in the DJIA are expected to affect the trading value of the Notes. Because dividends paid on the stocks included in the DJIA will be incorporated into the CBOE Index, if dividend yields on the stocks included in the DJIA increase, we expect that the trading value of the Notes will increase and, conversely, if dividend yields on these stocks decrease, we expect that the trading value of the Notes will decrease. Changes in our credit ratings may affect the trading value of the Notes. Our credit ratings are an assessment of our ability to pay our obligations. Consequently, real or anticipated changes in our credit ratings may affect the trading value of the Notes. However, because the return on your Notes is dependent upon factors in addition to our ability to pay our obligations under the Notes, such as the percentage change in the level of the Reference Index over the term of the Notes, an improvement in our credit ratings will not reduce the other investment risks related to the Notes. In general, assuming all relevant factors are held constant, we expect that the effect on the trading value of the Notes of a given change in some of the factors listed above will be less if it occurs later in the term of the Notes than if it occurs earlier in the term of the Notes. New York State law governs the 1983 Indenture under which the Notes will be issued. New York has usury laws that limit the amount of interest that can be charged and paid on loans, which includes debt securities like the Notes. Under present New York law, the maximum rate of interest is 25% per annum on a simple interest basis. This limit may not apply to debt securities in which $2,500,000 or more has been invested. While we believe that New York law would be given effect by a state or federal court sitting outside of New York, many other states also have laws that regulate the amount of interest that may be charged to and paid by a borrower. We will promise, for the benefit of the holders of the Notes, to the extent permitted by law, not to voluntarily claim the benefits of any laws concerning usurious rates of interest. We and our affiliates may from time to time buy or sell the stocks comprising the DJIA or futures or option contracts on those stocks or the DJIA for our own accounts for business reasons and expect to enter into these transactions in connection with hedging our obligations under the Notes. These transactions could affect the price of those stocks and the DJIA and, in turn, the level of the CBOE Index and the Reference Index in a manner that would be adverse to your investment in the Notes. Our subsidiary MLPF&S is our agent for the purposes of calculating, among other things, the Redemption Amount, Exchange Amount or Early Redemption Amount, as applicable. Under certain circumstances, MLPF&S as our subsidiary and its responsibilities as calculation agent for the Notes could give rise to conflicts of interest. These conflicts could occur, for instance, in connection with judgments that it would be required to make in the event of a discontinuance or unavailability of the CBOE Index. See the sections entitled “Description of the Notes—Adjustments to the CBOE Index; Market Disruption Events” and “—Discontinuance of the CBOE Index ” in this pricing supplement. MLPF&S is required to carry out its duties as calculation agent in good faith and using its reasonable judgment. However, because we control MLPF&S, potential conflicts of interest could arise. MLPF&S, as the underwriter, will pay an additional amount on each anniversary of the Pricing Date in 2006 through 2009 to brokers whose clients purchased their Notes in the initial distribution and continue to hold the Notes. In addition, MLPF&S may from time to time pay additional amounts to brokers whose clients purchased Notes in the secondary market and continue to hold the Notes. As a result of these arrangements, your broker may have economic interests that conflict with your economic interests because of the financial benefit it receives each year you retain your investment in the Notes. Please see the section entitled “Supplemental Plan of Distribution” in this pricing supplement. We expect to enter into arrangements to hedge the market risks associated with our obligation to pay the Redemption Amount, Exchange Amount or Early Redemption Amount, as applicable. We may seek competitive terms in entering into the hedging arrangements for the Notes, but are not required to do so, and we may enter into such hedging arrangements with one of our subsidiaries or affiliated companies. Such hedging activity is expected to result in a profit to those engaging in the hedging activity, which could be more or less than initially expected, but which could also result in a loss for the hedging counterparty. ML&Co. or its affiliates may presently or from time to time engage in business with one or more of the companies included in the DJIA including extending loans to, or making equity investments in, those companies or providing advisory services to those companies, including merger and acquisition advisory services. In the course of business, ML&Co. or its affiliates may acquire non-public information relating to those companies and, in addition, one or more affiliates of ML&Co. may publish research reports about those companies. ML&Co. does not make any representation to any purchasers of the Notes regarding any matters whatsoever relating to the companies included in the DJIA. Any prospective purchaser of the Notes should undertake an independent investigation of the companies included in the DJIA as in its judgment is appropriate to make an informed decision regarding an investment in the Notes. 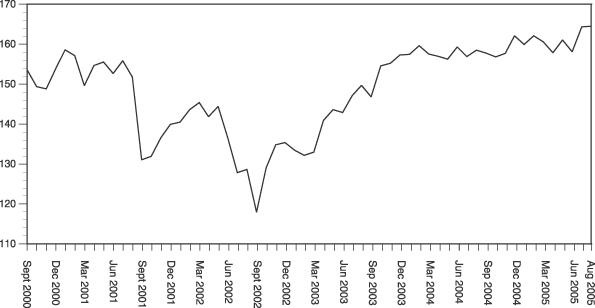 The composition of the DJIA does not reflect any investment recommendations of ML&Co. or its affiliates. You should consider the tax consequences of investing in the Notes, aspects of which are uncertain. See the section entitled “United States Federal Income Taxation” in this pricing supplement. ML&Co. will issue the Notes as part of a series of senior debt securities entitled “Medium-Term Notes, Series C” under the 1983 Indenture, which is more fully described in the accompanying prospectus. Unless earlier exchanged by you or redeemed early by us, the Notes will mature on November , 2010. Information included in this pricing supplement supercedes information in the accompanying prospectus supplement and prospectus to the extent that it is different from that information. The CUSIP number for the Notes is . The Notes may be exchanged by you or may be redeemed by us prior to the maturity date at the times or under the circumstances described below. ML&Co. will issue the Notes in denominations of whole units each with a $10 original public offering price per unit. You may transfer the Notes only in whole units. You will not have the right to receive physical certificates evidencing your ownership except under limited circumstances. Instead, we will issue the Notes in the form of a global certificate, which will be held by The Depository Trust Company, also known as DTC, or its nominee. Direct and indirect participants in DTC will record your ownership of the Notes. You should refer to the section entitled “Description of the Debt Securities—Depositary” in the accompanying prospectus. Unless you have exchanged or we have redeemed your Notes, on the maturity date you will be entitled to receive a cash amount per unit equal to the Redemption Amount as provided below. The “Starting Value” will be set to 100 on the date the Notes are priced for initial sale to the public (the “Pricing Date”). For purposes of determining the Redemption Amount, the “Ending Value” will be determined by the calculation agent and will equal the average of the closing levels of the Reference Index determined on each of the five Calculation Days during the Calculation Period. If there are fewer than five Calculation Days during the Calculation Period, then the Ending Value will equal the average of the closing levels of the Reference Index on those Calculation Days. If there is only one Calculation Day during the Calculation Period, then the Ending Value will equal the closing level of the Reference Index on that Calculation Day. If no Calculation Days occur during the Calculation Period, then the Ending Value will equal the closing level of the Reference Index determined on the last scheduled Trading Day in the Calculation Period, regardless of the occurrence of a Market Disruption Event (as described below under “—Adjustment to the CBOE Index; Market Disruption Events”) on that scheduled Trading Day. Because the Ending Value is calculated as described above, the Reference Index will not be reduced by the Monthly Payment Adjustment Amount during the final month of the term of the Notes. The “Calculation Period” means the period from and including the seventh scheduled Trading Day before the maturity date to and including the second scheduled Trading Day before the maturity date. A “Calculation Day” means any Trading Day during the Calculation Period on which a Market Disruption Event has not occurred. A “Trading Day” is a day, as determined by the calculation agent, on which the New York Stock Exchange (the “NYSE”), the American Stock Exchange (the “AMEX”), The Nasdaq Stock Market (the “Nasdaq”) and the Chicago Board Options Exchange (the “CBOE”) are open for trading, and the CBOE Index or any successor index is calculated and published. All determinations made by the calculation agent, absent a determination of a manifest error, will be conclusive for all purposes and binding on ML&Co. and the holders and beneficial owners of the Notes. The level of the Reference Index will be reduced daily by the Reference Index Adjustment Factor of 1.5% per annum and monthly by the Monthly Payment Adjustment Amount of 8.081% per annum of the initial Reference Index Level. As a result of these reductions, the level of the CBOE Index must increase significantly over the term of the Notes in order for the level of the Reference Index to increase sufficiently for you to receive at least the $10 original public offering price per unit on the maturity date, Exchange Date or Early Redemption Date, as applicable. If the level of the CBOE Index and therefore, the Reference Index, decreases or does not increase sufficiently over the term of the Notes, you will receive less, and possibly significantly less, than the $10 original public offering price per unit. See the section entitled “Risk Factors—Your investment may result in a loss” in this pricing supplement. Monthly payments on the Notes will accrue at the rate of 8% per annum on the $10 original public offering price per unit from and including November , 2005 or from the most recent monthly payment date for which monthly payments have been paid or provided for. No monthly payment will accrue, or be paid, during the final month of the term of the Notes. We will make monthly payments on the Notes in cash in arrears on the seventh Banking Business Day (as defined below) following the date the Monthly Payment Adjustment Amount is deducted from the Reference Index level, which date will be the first Trading Day of each month, beginning December , 2005, to but excluding the month in which the maturity date occurs (each a “Monthly Payment Adjustment Date”). We will make these payments to the persons in whose names the Notes are registered at the close of business on the second Banking Business Day following the Monthly Payment Adjustment Date. If the Monthly Payment Adjustment Date falls on a day that is not a Banking Business Day, the Monthly Payment Adjustment Date will be the next succeeding Banking Business Day. The monthly payments on the Notes will be computed on the basis of a 360-day year of twelve 30-day months. If a monthly payment date falls on a day that is not a Banking Business Day, that monthly payment will be made on the next Banking Business Day and no interest will accrue on that monthly payment as a result of the delayed payment. A “Banking Business Day” means any day other than a Saturday or Sunday that is not a day on which banking institutions in The City of New York are authorized or required by law, regulation or executive order to close. These monthly payments will be derived from the monthly reduction of the level of the Reference Index by the Monthly Payment Adjustment Amount, as discussed above. As a result, by investing in the Notes, you will receive current monthly income in exchange for a reduction of the Reference Index, and thus, the Redemption Amount, Exchange Amount or Early Redemption Amount, as applicable, that you will receive on the Notes. Exchange Notice Period will be extended to 12:00 noon in The City of New York on the next succeeding Banking Business Day. 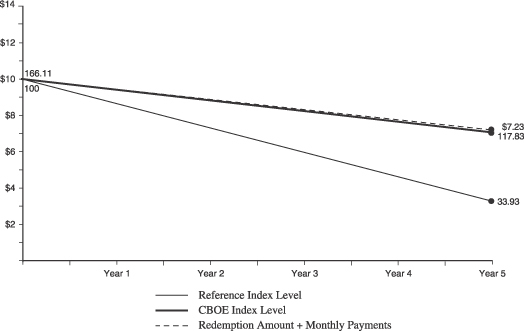 The amount of the cash payment you receive upon exchange will be equal to the Redemption Amount, calculated using an Ending Value equal to the level of the Reference Index on the Exchange Date (the “Exchange Amount”). An “Exchange Date” will be the third Trading Day following the end of the applicable Exchange Notice Period. If a Market Disruption Event occurs on the third Trading Day following an Exchange Notice Period, the Exchange Date for that year will be the next succeeding Trading Day on which a Market Disruption Event does not occur. The Exchange Amount will be paid three Banking Business Days after the Exchange Date. The Exchange Amount you receive may be greater than or less than the Redemption Amount on the maturity date depending upon the performance of the CBOE Index, and the related performance of the Reference Index, during the period from the Exchange Date to the maturity date. The Notes will be issued in registered global form and will remain on deposit with the depositary as described in the section entitled “Description of the Debt Securities—Depositary” in the accompanying prospectus. Therefore, you must exercise the option to exchange your Notes through the depositary. To make your exchange election effective, you must make certain that your notice is delivered to the depositary during the applicable Exchange Notice Period. To ensure that the depositary will receive timely notice of your election to exchange all or a portion of your Notes, you must instruct the direct or indirect participant through which you hold an interest in the Notes to notify the depositary of your election to exchange your Notes prior to 12:00 noon in The City of New York on the Banking Business Day of the applicable Exchange Notice Period, in accordance with the then applicable operating procedures of the depositary. Different firms have different deadlines for accepting instructions from their customers. You should consult the direct or indirect participant through which you hold an interest in the Notes to ascertain the deadline for ensuring that timely notice will be delivered to the depositary. If at any time the global securities are exchanged for Notes in definitive form, from and after that time, notice of your election to exchange must be delivered to JPMorgan Chase Bank, N.A., as trustee under the Indenture, through the procedures required by the trustee by 12:00 noon in The City of New York on the last day of the applicable Exchange Notice Period. If on any Trading Day before the first Calculation Day in the Calculation Period the Reference Index is equal to or less than 20, the Notes will be redeemed by us on the fifth Banking Business Day following that date (the “Early Redemption Date”). In the event of an early redemption, on the Early Redemption Date, we will pay you a cash amount per unit equal to the Redemption Amount, calculated using an Ending Value equal to the average of the closing levels of the Reference Index on the two Trading Days immediately succeeding the Trading Day on which the closing level of the Reference Index was equal to or less than 20 (the “Early Redemption Amount”), regardless of the occurrence of a Market Disruption Event on that Trading Day. The “Reference Index” is designed to track an adjusted performance of the CBOE Index over the term of the Notes. The level of the Reference Index will be based upon the daily percentage change in the level of the CBOE Index as reduced by (i) a Reference Index adjustment factor of 1.5% per annum (the “Reference Index Adjustment Factor”), deducted daily on the basis of an actual 365-day year and (ii) a monthly payment adjustment amount of 8.081% per annum of the initial Reference Index level (the “Monthly Payment Adjustment Amount”), deducted monthly on the basis of a 360-day year of twelve 30-day months. The Monthly Payment Adjustment Amount will not be deducted from the Reference Index during the final month of the term of the Notes. The level of the Reference Index will be set to 100 on the Pricing Date and will be calculated and published daily by the AMEX under the trading symbol “BWRIN”. The AMEX in no way sponsors, endorses or is otherwise involved in the transactions specified and described in this pricing supplement and the AMEX disclaims any liability to any party for any inaccuracy in the data on which the Reference Index is based, for any mistakes, errors or omissions in the calculation and/or dissemination of the Reference Index, or for the manner in which it is applied in connection with this pricing supplement. While historical information on the Reference Index will not exist before the Pricing Date, the following table sets forth the hypothetical historical levels of the Reference Index on the last business day of each month from September 2000 through August 2005 based upon historical levels of the CBOE Index and a Reference Index level of 100 set as of September 18, 2000. The hypothetical levels for the Reference Index below are also based on the assumption that the Monthly Payment Adjustment Amount was deducted on the first Banking Business Day of each month. This hypothetical historical data on the Reference Index is not necessarily indicative of the future performance of the Reference Index or what the value of the Notes may be. Any historical upward or downward trend in the level of the Reference Index during any period set forth below is not an indication that the Reference Index is more or less likely to increase or decrease at any time over the term of the Notes. The following graph sets forth the hypothetical historical performance of the Reference Index presented in the preceding table. This hypothetical historical information is not necessarily indicative of the future performance of the Reference Index. 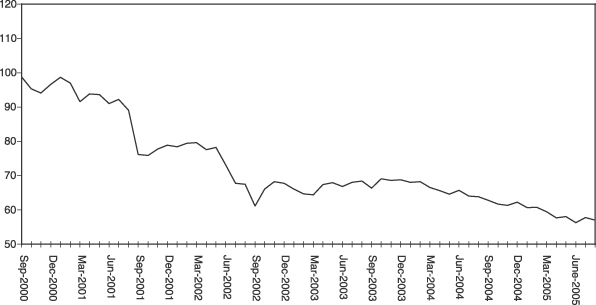 Because the Monthly Payment Adjustment Amount reduces the Reference Index at a rate of 8.081% per annum of the initial Reference Index level, the magnitude of the effect of the Monthly Payment Adjustment Amount on the Reference Index level will depend on the direction, magnitude, timing and duration of the changes in the level of the CBOE Index over the term of the Notes. Five hypothetical examples have been included to demonstrate the effect that the Monthly Payment Adjustment Amount has on the Reference Index level and thus the Redemption Amount you would receive on the maturity date depending on the performance of the CBOE Index over the term of the Notes. 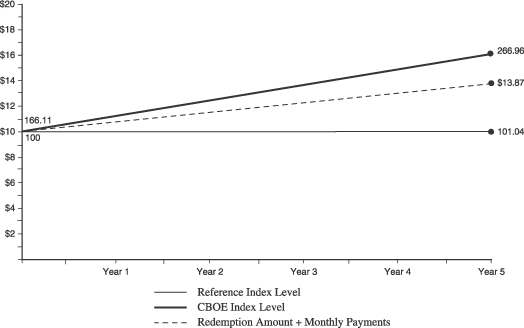 The graph in each hypothetical example presents the hypothetical (i) performance of the CBOE Index level, (ii) Reference Index level and (iii) total amount that you would receive in monthly payments plus the Redemption Amount. Although these graphs in the hypothetical examples below are intended to show generally the direction, magnitude, timing and duration of changes in (i), (ii) and (iii) of the preceding sentence, they are not exact representations of the actual hypothetical levels of the CBOE Index, the Reference Index or the Redemption Amount at each point over the term of the Notes and should not viewed in that respect. The following hypothetical examples assume: (i) an initial CBOE Index level of 166.11 set as of September 18, 2000, (ii) an initial Reference Index level of 100, (iii) a 5 year investment term, (iv) that the Notes have not been exchanged or redeemed prior to the stated maturity date and (v) total monthly payments of approximately $3.87. This example demonstrates that the level of the CBOE Index must increase significantly over the term of the Notes in order for you to receive a cash amount on the maturity date that at least equals the $10 original public offering price per unit of the Notes. This example demonstrates that if the level of the CBOE Index decreases at a constant rate over the term of the Notes, on the maturity date you will receive an amount that is significantly less than the $10 original public offering price per unit of the Notes. In this example, the CBOE Index increases for approximately the first 30 months of the term of the Notes and then decreases such that the average CBOE Index level during the Calculation Period is equal to the initial CBOE Index level. This example demonstrates that your return on the maturity date will depend on the direction, magnitude, timing and duration of the changes in the CBOE Index level, and may result in a negative return despite the fact that the average CBOE Index level during the Calculation Period is the same as the initial CBOE Index level. In this example, the CBOE Index decreases for approximately the first 30 months of the term of the Notes and then increases such that the average CBOE Index level during the Calculation Period is equal to the initial CBOE Index level. This example demonstrates the magnified negative effect that the Monthly Payment Adjustment Amount has on the Reference Index level if the CBOE Index declines earlier in the term of the Notes. The Monthly Payment Adjustment Amount produces a greater percentage reduction in exposure to the CBOE Index as the CBOE Index declines. Thus, even as the CBOE Index recovers from its lowest level, the Reference Index increases at a slower rate than the CBOE Index because of the reduction produced by application of the Monthly Payment Adjustment Amount. In this example, the CBOE Index (i) increases for approximately the first 20 months of the term of the Notes (ii) then decreases for approximately the next 20 months of the term of the Notes and (iii) then increases such that the average CBOE Index level during the Calculation Period is equal to the initial CBOE Index level. The Reference Index level in this example 5 is higher than in example 4 despite the fact that the level of the average CBOE Index during the Calculation Period is the same in both examples. The reason for this difference is that as the CBOE Index increases over the first 20 months of the term of the Notes, the Monthly Payment Adjustment Amount produces less of a percentage reduction of the Reference Index because of the growth in the CBOE Index. If at any time the CBOE makes a material change in the formula for or the method of calculating the CBOE Index or in any other way materially modifies the CBOE Index so that the CBOE Index does not, in the opinion of the calculation agent, fairly represent the level of the CBOE Index had those changes or modifications not been made, then, from and after that time, the calculation agent will, at the close of business in New York, New York, on each date that the closing level of the CBOE Index is to be calculated, make any adjustments as, in the good faith judgment of the calculation agent, may be necessary in order to arrive at a calculation of a level of a stock index comparable to the CBOE Index as if those changes or modifications had not been made, calculate the closing level with reference to the CBOE Index, as so adjusted and provide such adjusted levels to AMEX for purposes of calculating the level of the Reference Index. Accordingly, if the method of calculating the CBOE Index is modified so that the level of the CBOE Index is a fraction or a multiple of what it would have been if it had not been modified, e.g., due to a split, then the calculation agent will adjust the CBOE Index in order to arrive at a level of the CBOE Index as if it had not been modified, e.g., as if a split had not occurred. (B) the suspension of or material limitation on trading for more than two hours of trading, or during the one-half hour period preceding the close of trading, on the applicable exchange (without taking into account any extended or after-hours trading session), whether by reason of movements in price otherwise exceeding levels permitted by the applicable exchange or otherwise, in option contracts or futures contracts related to the DJIA, or any successor index, which are traded on any major United States exchange. (4) for the purpose of clause (A) above, any limitations on trading during significant market fluctuations under NYSE Rule 80B, or any applicable rule or regulation enacted or promulgated by the NYSE or any other self regulatory organization or the Securities and Exchange Commission of similar scope as determined by the calculation agent, will be considered “material”. calculation of the payment on the maturity date or upon exchange or early redemption you may receive. See the section entitled “—Payment on the Maturity Date”, “—Exchange of the Notes Prior to the Maturity Date” and “—Early Redemption” in this pricing supplement. If the CBOE discontinues publication of the CBOE Index and the CBOE or another entity publishes a successor or substitute index that the calculation agent determines, in its sole discretion, to be comparable to the CBOE Index (a “successor index”), then, upon the calculation agent’s notification of that determination to the trustee and ML&Co., the calculation agent will substitute the successor index as calculated by the CBOE or any other entity for the CBOE Index and provide the levels of the successor index to AMEX for purposes of calculating the level of the Reference Index. Upon any selection by the calculation agent of a successor index, ML&Co. will cause notice to be given to holders of the Notes. the calculation agent will compute a substitute level for the CBOE Index in accordance with the procedures last used to calculate the CBOE Index before any discontinuance. If a successor index is selected or the calculation agent calculates a level as a substitute for the CBOE Index as described below, the successor index or level will be used as a substitute for the CBOE Index for all purposes, including the purpose of determining whether a Market Disruption Event exists. the calculation agent will determine the value that would be used in computing the Redemption Amount, Exchange Amount or Early Redemption Amount, as applicable, as described in the preceding paragraph as if that day were a Calculation Day. The calculation agent will cause notice of each value to be published not less often than once each month in The Wall Street Journal or another newspaper of general circulation and arrange for information with respect to these values to be made available by telephone. Notwithstanding these alternative arrangements, discontinuance of the publication of the CBOE Index may adversely affect trading in the Notes. In case an Event of Default with respect to any Notes has occurred and is continuing, the amount payable to a holder of a Note upon any acceleration permitted by the Notes, with respect to each $10 original public offering price per unit, will be equal to the Redemption Amount, calculated as though the date of acceleration were the stated maturity date of the Notes. If a bankruptcy proceeding is commenced in respect of ML&Co., the claim of the holder of a Note may be limited, under Section 502(b)(2) of Title 11 of the United States Code, to the $10 original public offering price per unit plus an additional amount of contingent interest calculated as though the date of the commencement of the proceeding were the stated maturity date of the Notes. In case of default in payment of the Notes, whether on the stated maturity date or upon exchange, early redemption or acceleration, from and after that date the Notes will bear interest, payable upon demand of their holders, at the rate of % per annum, to the extent that payment of interest is legally enforceable on the unpaid amount due and payable on that date in accordance with the terms of the Notes to the date payment of that amount has been made or duly provided for. The CBOE Index was established on October 16, 1997 and is calculated and disseminated by the CBOE under the index symbol “BXD”. The CBOE Index is a total return index designed to track the performance of a hypothetical “covered call” strategy on the DJIA by reflecting the price changes and dividends of the stocks comprising the DJIA and the option premiums received from the sale of at or slightly out of the money monthly call options on the DJIA. This “covered call” strategy consists of a hypothetical portfolio consisting of a “long” position indexed to the DJIA (i.e., a position in which the stocks comprising the DJIA are held) on which are deemed sold a succession of one-month, at or slightly out of the money call options on the DJIA listed on the CBOE. The sale of the call options are “covered” by the long position in the DJIA with a notional amount equal to that of the call options. The dividends paid on the stocks that comprise the DJIA and the premiums in respect of the written call options will be incorporated into the CBOE Index and those amounts will then be subject to the price movements of the DJIA and the call options on the DJIA. 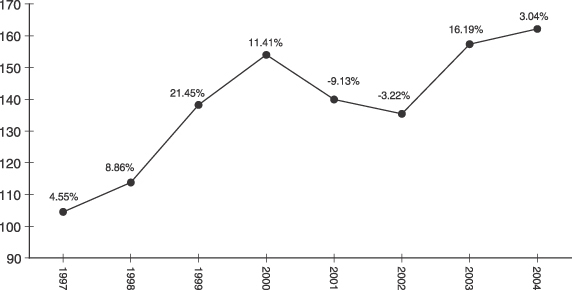 The indicated annual dividend yield of the stocks comprising the DJIA as of September 15, 2005 was 2.49%. This “covered call” strategy provides income from call option premiums received from the sale (or writing) of the call options, which helps, to a limited extent, to offset losses if there is a decline in the level of the DJIA. However, this strategy limits participation in any appreciation of the DJIA beyond the call option’s exercise price. Thus, in a period of significant stock market increases, this “covered call” strategy will tend to produce lower returns than ownership of a direct investment in the DJIA. Unless otherwise stated, all information herein on the CBOE Index is derived from the CBOE or other publicly available sources. We make no representation or warranty as to the accuracy or completeness of such information. This information reflects the policies of CBOE as stated in publicly available sources and the policies are subject to change by CBOE. CBOE is under no obligation to continue to publish the CBOE Index and may discontinue publication of the CBOE Index at any time. The call options included in the CBOE Index have successive terms of approximately one month and generally expire on the third Friday of each month (each, an “Expiration Date”). On the Expiration Date, the call option is settled against the Special Opening Quotation (symbol “SET”) of the DJIA (the “SOQ”). The SOQ is a calculation of the DJIA that is compiled from the opening prices of the stocks that comprise the DJIA. The SOQ calculation is performed when all 30 stocks comprising the DJIA have opened for trading, and is usually determined before 11:00 a.m., New York City time. If the SOQ is greater than the exercise price of the expiring call option, the settlement of that call option will result in a decrease in the level of the CBOE Index. If the SOQ is less than or equal to the exercise price of the expiring call option, that call option will expire worthless without affecting the level of the CBOE Index. Subsequent to the settlement of an expiring call option on an Expiration Date, a new at or slightly out of the money call option expiring in the next month will then be deemed sold on that Expiration Date. The exercise price of the new call option will be the DJIA call option listed on the CBOE with an exercise price equal to, or the closest exercise price above, the last level of the DJIA reported before 11:00 a.m., New York City time. For example, if the last DJIA level reported before 11:00 a.m., New York City time, is 900.00 and there is an DJIA call option with the exercise price of 900, then the DJIA call option with the exercise price of 900 will be selected as the new call option to be included in the CBOE Index for the next month. If the last DJIA level reported before 11:00 a.m., New York City time, is 901.10, there is no DJIA call option with an exercise price of 901.10 and the closest listed DJIA call option exercise price above 901.10 is 905, then the DJIA call option with the exercise price of 905 will be selected as the new call option to be included in the CBOE Index for the next month. Once the exercise price of a new call option has been identified, the new call option will be deemed sold on the Expiration Date at a price equal to the volume-weighted average of the traded prices (the “VWAP”) of the new call option during the half-hour period beginning at 11:30 a.m., New York City time. The CBOE calculates the VWAP by calculating the weighted average of the trading prices of that new call option between 11:30 a.m. and 12:00 p.m., New York City time, excluding trades in that new call option that are identified by the CBOE as having been executed as part of a position taken in two or more options in order to profit through changes in the relative prices of those options, which is known as a “spread”. The source of the trading prices used in the calculation of the VWAP is CBOE’s Market Data Retrieval System. If no trades occur in the new call option between 11:30 a.m. and 12:00 p.m., New York City time, then the new call option will be deemed sold at the last bid price reported before 12:00 p.m., New York City time. The CBOE Index is calculated by the CBOE once per day at the close of trading. The CBOE Index is a “chained” index in that its value is equal to the product of 100 and the cumulative product of the daily gross rates of return on the CBOE Index since the CBOE Index was first calculated and set to 100 on its inception date of October 16, 1997. On each trading day that is not an Expiration Date, the daily gross rate of return of the CBOE Index will equal the change in the value of the DJIA and the call option on the DJIA, including the value of ordinary cash dividends payable on the stocks comprising the DJIA that trade “ex-dividend” on that date (the “Gross Rate of Return”), as measured from the close of trading on the preceding trading day. On each Expiration Date, the daily gross rate of return will equal the average of (i) the Gross Rate of Return from the close of trading on the preceding day to the time the expiring call option is settled, (ii) the Gross Rate of Return from the time the expiring call option is settled to the time the new call option is deemed sold and (iii) the Gross Rate of Return from the time the new call option is deemed sold to the close of trading on the Expiration Date. Unless otherwise stated, all information herein on the Index is derived from Dow Jones or other publicly available sources. This information reflects the policies of Dow Jones as stated in the publicly available sources and the policies are subject to change by Dow Jones. Dow Jones is under no obligation to continue to publish the Index and may discontinue publication of the Index at any time. The DJIA is a price-weighted index, i.e., the weight of a component stock in the DJIA is based on its price per share rather than the total market capitalization of the issuer of the component stock, comprised of 30 common stocks chosen by the editors of The Wall Street Journal (the “WSJ”) as representative of the broad market of U.S. industry. The corporations represented in the DJIA tend to be leaders within their respective industries and their stocks are typically widely held by individuals and institutional investors. Changes in the composition of the DJIA are made entirely by the editors of the WSJ without consultation with the corporations represented in the DJIA, any stock exchange, any official agency or ML&Co. Changes to the common stocks included in the DJIA tend to be made infrequently. Historically, most substitutions have been the result of mergers, but, from time to time, changes may be made to achieve what the editors of the WSJ deem to be a more accurate representation of the broad market of U.S. industry. In choosing a new corporation for the DJIA, the editors of the WSJ look for leading industrial companies with a successful history of growth and wide interest among investors. The component stocks of the DJIA may be changed at any time for any reason. Dow Jones, publisher of the WSJ, is not affiliated with ML&Co. and has not participated in any way in the creation of the Notes. The DJIA initially consisted of 12 common stocks and was first published in the WSJ in 1896. The DJIA was increased to include 20 common stocks in 1916 and to 30 common stocks in 1928. The number of common stocks in the DJIA has remained at 30 since 1928, and, in an effort to maintain continuity, the constituent corporations represented in the DJIA have been changed on a relatively infrequent basis. The level of the DJIA is the sum of the primary exchange prices of each of the 30 common stocks included in the DJIA, divided by a divisor that is designed to provide a meaningful continuity in the level of the DJIA. Because the DJIA is price-weighted, stock splits or changes in the component stocks could result in distortions in the level of the DJIA. In order to prevent these distortions related to extrinsic factors, the divisor is changed in accordance with a mathematical formula that reflects adjusted proportions within the DJIA. The current divisor of the DJIA is published daily in the WSJ and other publications. In addition, other statistics based on the DJIA may be found in a variety of publicly available sources. The following graph sets forth the historical year-end closing levels of the CBOE Index and the annual percentage increase or decrease of the CBOE Index for each year from 1997 through 2004. The level of the CBOE Index was set at 100 on October 16, 1997. This historical performance should not be taken as an indication of future performance, and no assurance can be given that the level of the CBOE Index will not decline, or that the level of the CBOE Index will increase at a rate that is sufficient to result in the full return of your original investment on the maturity date, Exchange Date or Early Redemption Date, as applicable. The following table sets forth the historical month-end closing levels of the CBOE Index from January 2000 through August 2005. This historical data is not necessarily indicative of future performance or what the value of the Notes may be. Any historical upward or downward trend in the level of the CBOE Index during any period set forth below is not any indication that the CBOE Index is more or less likely to increase or decrease at any time during the term of the Notes. The following graph sets forth the historical performance of the CBOE Index presented in the preceding table. Past movements of the CBOE Index are not necessarily indicative of its future performance. On September 15, 2005, the level of the closing level of the CBOE Index was 166.11. The following graph sets forth the historical annual average percentage returns resulting from the option premiums received from the sale of successive one-month, at the money call options on the DJIA from October 1997 (annualized for that year) through 2004. Past performance based on this historical data is not necessarily indicative of any future performance. Dow Jones and MLPF&S have entered into a non-exclusive license agreement with MLPF&S providing for the license to MLPF&S and ML&Co., in exchange for a fee, of the right to use the CBOE Index, which is owned and published by the CBOE, in connection with issuance of certain securities, including the Notes. “The Notes are not sponsored, endorsed, sold or promoted by Dow Jones. Dow Jones makes no public representation or warranty, express or implied to the owners of the Notes or any member of the public regarding the advisability of investing in securities generally or in the Notes particularly. Dow Jones’ only relationship to MLPF&S and ML&Co. is the licensing of certain trademarks, trade names and service marks of Dow Jones and of the CBOE Index, which is determined, composed and calculated by Dow Jones and without regard to ML&Co. or the Notes. Dow Jones has no obligation to take the needs of ML&Co. or the holders of the Notes into consideration in determining, composing or calculating the CBOE Index. Dow Jones is not responsible for and has not participated in the determination of the timing of, prices at, or quantities of the Notes to be issued or in the determination or calculation of the equation by which the Notes are to be converted into cash. Dow Jones has no obligation or liability in connection with the administration, marketing or trading of the Notes. Set forth in full below is the opinion of Sidley Austin Brown & Wood LLP, counsel to ML&Co. (“Tax Counsel”). As the law applicable to the U.S. federal income taxation of instruments such as the Notes is technical and complex, the discussion below necessarily represents only a general summary. The following discussion is based upon laws, regulations, rulings and decisions now in effect, all of which are subject to change (including changes in effective dates) or possible differing interpretations. The discussion below supplements the discussion set forth under the section entitled “United States Federal Income Taxation” that is contained in the accompanying prospectus supplement and supercedes that discussion to the extent that it contains information that is inconsistent with that which is contained in the accompanying prospectus supplement. The discussion below deals only with Notes held as capital assets and does not purport to deal with persons in special tax situations, such as financial institutions, insurance companies, regulated investment companies, real estate investment trusts, tax-exempt entities (except to the extent specifically discussed below), dealers in securities or currencies, persons holding Notes as a hedge against currency risks, as a position in a “straddle” or as part of a “hedging”, “conversion” or “integrated” transaction for tax purposes, or persons whose functional currency is not the United States dollar. It also does not deal with holders other than original purchasers (except where otherwise specifically noted). If a partnership holds the Notes, the tax treatment of a partner in the partnership will generally depend upon the status of the partner and the activities of the partnership. Thus, persons who are partners in a partnership holding the Notes should consult their own tax advisors. Moreover, all persons considering the purchase of the Notes should consult their own tax advisors concerning the application of U.S. federal income tax laws to their particular situations as well as any consequences of the purchase, ownership and disposition of the Notes arising under the laws of any other taxing jurisdiction. As used herein, the term “U.S. Holder” means a beneficial owner of a Note that is for U.S. federal income tax purposes (i) a citizen or resident of the United States, (ii) a corporation or a partnership (including an entity treated as a corporation or a partnership for U.S. federal income tax purposes) that is created or organized in or under the laws of the United States, any state thereof or the District of Columbia (unless, in the case of a partnership, Treasury regulations are adopted that provide otherwise), (iii) an estate the income of which is subject to U.S. federal income tax regardless of its source, (iv) a trust if a court within the United States is able to exercise primary supervision over the administration of the trust and one or more United States persons have the authority to control all substantial decisions of the trust or (v) any other person whose income or gain in respect of a Note is effectively connected with the conduct of a United States trade or business. Certain trusts not described in clause (iv) above in existence on August 20, 1996, that elect to be treated as United States persons will also be U.S. Holders for purposes of the following discussion. As used herein, the term “non-U.S. Holder” means a beneficial owner of a Note that is not a U.S. Holder. opinion of Tax Counsel, such characterization and tax treatment of the Notes, although not the only reasonable characterization and tax treatment, is based on reasonable interpretations of law currently in effect and, even if successfully challenged by the Internal Revenue Service (the “IRS”), will not result in the imposition of penalties. Furthermore, based on ML&Co.’s determination of the relative fair market values of the Components at the time of issuance of the Notes, ML&Co. will assign $ of the original issue price of the Notes to the Debt Instrument and will assign $ of the original issue price of the Notes to the Forward Contract. Based upon the foregoing, a U.S. Holder who acquires a Note in connection with the original issuance thereof will be treated as having purchased the Debt Instrument for $ and as having received an initial payment (the “Initial Forward Contract Payment”) with respect to the Forward Contract in an amount equal to $ . The initial payment deemed to have been received by a U.S. Holder with respect to the Forward Contract (i.e., the Initial Forward Contract Payment) should only be taken into account by the U.S. Holder as an additional amount realized with respect to the Forward Contract on the earlier of the sale, exchange, early redemption or other disposition of the Notes by the U.S. Holder or on the maturity date. ML&Co.’s allocation of the original issue price will be binding on a U.S. Holder of a Note, unless such U.S. Holder timely and explicitly discloses to the IRS that its allocation is different from ML&Co.’s. The treatment of the Notes described above and ML&Co.’s allocation are not, however, binding on the IRS or the courts. No statutory, judicial, administrative or other authority directly addresses the characterization of the Notes or instruments similar to the Notes for U.S. federal income tax purposes, and no ruling is being requested from the IRS with respect to the Notes. Due to the absence of authorities that directly address instruments that are similar to the Notes, significant aspects of the U.S. federal income tax consequences of an investment in the Notes are not certain, and no assurance can be given that the IRS or the courts will agree with the characterization described above. Accordingly, prospective purchasers are urged to consult their own tax advisors regarding the U.S. federal income tax consequences of an investment in a Note (including alternative characterizations of a Note) and with respect to any tax consequences arising under the laws of any state, local or foreign taxing jurisdiction. Unless otherwise stated, the following discussions are based on the assumption that the treatment and the allocation described above are accepted for U.S. federal income tax purposes. Interest on the Debt Instrument. As described above, the Debt Instrument is treated as bearing interest (i.e., “qualified stated interest”) payable monthly at a stated rate of 8% per annum (i.e., the Interest Rate). A U.S. Holder will include such “qualified stated interest” on the Debt Instrument (i.e., the monthly payments on the Notes) in income in accordance with the U.S. Holder’s method of accounting for U.S. federal income tax purposes (subject to the bond premium rules). Based on ML&Co.’s determination set forth above, the U.S. Holder’s tax basis in the Debt Instrument will initially be $ . Settlement of the Forward Contract. Upon the final settlement of the Forward Contract on the maturity date, a U.S. Holder would be deemed to have applied an amount (the “Forward Contract Payment Amount”) equal to the principal amount of the Debt Instrument less the Initial Forward Contract Payment toward the right to receive a payment of the Redemption Amount on the maturity date. Upon the receipt of a payment of the Redemption Amount on the maturity date, a U.S. Holder will recognize gain or loss. The amount of such gain or loss will be the extent to which the Redemption Amount differs from the Forward Contract Payment Amount. It is uncertain whether any such gain or loss would be treated as ordinary income or loss or capital gain or loss. Absent a future clarification in current law (by an administrative determination or judicial ruling), where required, ML&Co. intends to report any such gain or loss to the IRS in a manner consistent with the treatment of such gain or loss as capital gain or loss. If such gain or loss is treated as capital gain or loss, then any such gain or loss will generally be long-term capital gain or loss if the U.S. Holder has held the Note for more than one year as of the maturity date. The deductibility of capital losses is subject to certain limitations. Amount. Upon the receipt of a payment of the Exchange Amount, a U.S. Holder will recognize gain or loss. The amount of such gain or loss will be the extent to which the Exchange Amount differs from the Forward Contract Payment Amount. Such gain or loss, if any, will be capital gain or loss and will generally be long-term capital gain or loss if the U.S. Holder has held the Note for more than one year as of the date on which the U.S. Holder receives the Exchange Amount. The deductibility of capital losses is subject to certain limitations. Any payment made in respect of accrued and unpaid monthly payments upon an exchange of a Note by a U.S. Holder will be taxable to a U.S. Holder in the manner described under “Tax Treatment of a Note—Interest on the Debt Instrument” above. In the event of an early redemption of the Notes, a U.S. Holder should be deemed to have applied the Forward Contract Payment Amount toward the right to receive the Early Redemption Amount on the Early Redemption Date. Upon the receipt of a payment of the Early Redemption Amount on the Early Redemption Date, a U.S. Holder will recognize gain or loss. The amount of such gain or loss will be the extent to which the Early Redemption Amount differs from the Forward Contract Payment Amount. Such gain or loss, if any, will be capital gain or loss and will generally be long-term capital gain or loss if the U.S. Holder has held the Note for more than one year as of the Early Redemption Date. The deductibility of capital losses is subject to certain limitations. Any payment made in respect of accrued and unpaid monthly payments upon an early redemption of the Notes will be taxable to a U.S. Holder in the manner described under “Tax Treatment of a Note—Interest on the Debt Instrument” above. Upon a sale of a Note prior to the maturity date of the Note, a U.S. Holder would recognize taxable gain or loss equal to the difference between the amount realized on such sale (as allocated among the Components in accordance with their relative fair market values) and such U.S. Holder’s tax basis in the Components deemed so sold. Any such gain or loss would generally be long-term or short-term capital gain or loss (depending upon the U.S. Holder’s holding period for the Note). For these purposes, any amount attributable to accrued interest on the Debt Instrument would generally be taxed as described under “Tax Treatment of a Note—Interest on the Debt Instrument” above. If a U.S. Holder purchases the Debt Instrument for an amount that is greater than the sum of all amounts payable on the Debt Instrument after the purchase date other than payments of qualified stated interest (i.e., the principal amount), such U.S. Holder will be considered to have purchased the Debt Instrument with “amortizable bond premium” equal in amount to such excess. A U.S. Holder may elect to amortize such premium using a constant yield method over the remaining term of the Debt Instrument and may offset interest otherwise required to be included in respect of the Debt Instrument during any taxable year by the amortized amount of such excess for the taxable year. Any election to amortize bond premium applies to all taxable debt instruments acquired by the U.S. Holder on or after the first day of the first taxable year to which such election applies and may be revoked only with the consent of the IRS. Due to the absence of authorities that directly address the proper characterization of the Notes, no assurance can be given that the IRS will accept, or that a court will uphold, the characterization and tax treatment described above. In particular, the IRS could seek to analyze the U.S. federal income tax consequences of owning a Note under Treasury regulations governing contingent payment debt instruments (the “Contingent Payment Regulations”). required to accrue as original issue discount, subject to the adjustments described below, income at a “comparable yield” on the issue price, regardless of the U.S. Holder’s usual method of accounting for U.S. federal income tax purposes. In addition, the Contingent Payment Regulations require that a projected payment schedule, which results in such a “comparable yield,” be determined, and that adjustments to income accruals be made to account for differences between actual payments and projected amounts. Furthermore, any gain realized with respect to a Note would generally be treated as ordinary income, and any loss realized would generally be treated as ordinary loss to the extent of the U.S. Holder’s prior ordinary income inclusions (which were not previously reversed) with respect to the Notes. Even if the Contingent Payment Regulations do not apply to the Notes, other alternative U.S. federal income tax characterizations or treatments of the Notes are also possible, which may also affect the timing and the character of the income or loss with respect to the Notes. For instance, under another possible alternative U.S. federal income tax characterization and treatment of the Notes, it is possible that a U.S. Holder would not be required to currently include in income the monthly payments on the Notes but should rather treat such monthly payments as a nontaxable return of capital. Accordingly, prospective purchasers are urged to consult their tax advisors regarding the U.S. federal income tax consequences of an investment in a Note. Section 1260 of the Internal Revenue Code of 1986, as amended (the “Code”) treats a taxpayer owning certain types of derivative positions in property as having “constructive ownership” of that property, with the result that all or a portion of any long-term capital gain recognized by such taxpayer with respect to the derivative position will be recharacterized as ordinary income. In its current form, Section 1260 of the Code does not apply to the Notes. If Section 1260 of the Code were to apply to the Notes in the future, however, the effect on a U.S. Holder of a Note would be to treat all or a portion of any long-term capital gain recognized by such U.S. Holder on the sale, exchange, early redemption, or maturity of a Note as ordinary income. In addition, Section 1260 of the Code would impose an interest charge on any such gain that was recharacterized. U.S. Holders should consult their tax advisors regarding the potential application of Section 1260 of the Code, if any, to the purchase, ownership and disposition of a Note. Section 511 of the Code generally imposes a tax, at regular corporate or trust income tax rates, on the “unrelated business taxable income” of certain tax-exempt organizations, including qualified pension and profit sharing plan trusts and individual retirement accounts. As discussed above, the U.S. federal income tax characterization of the Notes is uncertain. Nevertheless, in general, if the Notes are held for investment purposes, the amount of income or gain, if any, realized with respect to a Note, or any income that would accrue to a holder of a Note if the Notes were characterized as contingent payment debt instruments (as discussed above), will not constitute unrelated business taxable income. However, if a Note constitutes debt-financed property (as defined in Section 514(b) of the Code) by reason of indebtedness incurred by a holder of a Note to purchase the Note, all or a portion of any income or gain realized with respect to such Note may be classified as unrelated business taxable income pursuant to Section 514 of the Code. Moreover, prospective investors in the Notes should be aware that whether or not any income or gain realized with respect to a Note which is owned by an organization that is generally exempt from U.S. federal income taxation pursuant to Section 501(a) of the Code constitutes unrelated business taxable income will depend upon the specific facts and circumstances applicable to such organization. Accordingly, any potential investors in the Notes that are generally exempt from U.S. federal income taxation pursuant to Section 501(a) of the Code are urged to consult with their own tax advisors concerning the U.S. federal income tax consequences to them of investing in the Notes. In the case of a non-U.S. Holder, ML&Co. intends to withhold applicable United States withholding taxes at a rate of 30% on payments of interest made with respect to the Notes subject to reduction by applicable treaty or upon the receipt of a Form W-8ECI from a non-U.S. Holder claiming that the payments are effectively connected with the conduct of a United States trade or business. Any capital gain realized upon the sale or other disposition of a Note by a non-U.S. Holder will generally not be subject to U.S. federal income tax if (i) such gain is not effectively connected with a United States trade or business of such non-U.S. Holder and (ii) in the case of an individual non-U.S. Holder, such individual is not present in the United States for 183 days or more in the taxable year of the sale or other disposition and such individual does not have a “tax home” (as defined for U.S. federal income tax purposes) in the United States. A beneficial owner of a Note may be subject to information reporting with respect to certain amounts paid to the beneficial owner. A beneficial owner of a Note may also be subject to backup withholding at the applicable statutory rate of U.S. federal income tax on certain amounts paid to the beneficial owner unless such beneficial owner provides proof of an applicable exemption or a correct taxpayer identification number, and otherwise complies with applicable requirements of the backup withholding rules. Any amounts withheld under the backup withholding rules from a payment to a beneficial owner would be allowed as a refund or a credit against such beneficial owner’s U.S. federal income tax provided the required information is furnished to the IRS. Each fiduciary of a pension, profit-sharing or other employee benefit plan (a “plan”) subject to the Employee Retirement Income Security Act of 1974, as amended (“ERISA”), should consider the fiduciary standards of ERISA in the context of the plan’s particular circumstances before authorizing an investment in the Notes. Accordingly, among other factors, the fiduciary should consider whether the investment would satisfy the prudence and diversification requirements of ERISA and would be consistent with the documents and instruments governing the plan, and whether the investment would involve a prohibited transaction under Section 406 of ERISA or Section 4975 of the Code. Section 406 of ERISA and Section 4975 of the Code prohibit plans, as well as individual retirement accounts and Keogh plans subject to Section 4975 of the Code (also “plans”) from engaging in certain transactions involving “plan assets” with persons who are “parties in interest” under ERISA or “disqualified persons” under the Code (“parties in interest”) with respect to the plan or account. A violation of these prohibited transaction rules may result in civil penalties or other liabilities under ERISA and/or an excise tax under Section 4975 of the Code for those persons, unless exemptive relief is available under an applicable statutory, regulatory or administrative exemption. Certain employee benefit plans and arrangements including those that are governmental plans (as defined in Section 3(32) of ERISA), certain church plans (as defined in Section 3(33) of ERISA) and foreign plans (as described in Section 4(b)(4) of ERISA) (“non-ERISA arrangements”) are not subject to the requirements of ERISA or Section 4975 of the Code but may be subject to similar provisions under applicable federal, state, local, foreign or other regulations, rules or laws (“similar laws”). (5) PTCE 96-23, an exemption for plan asset transactions managed by in-house asset managers. The Notes may not be purchased or held by (1) any plan, (2) any entity whose underlying assets include “plan assets” by reason of any plan’s investment in the entity (a “plan asset entity”) or (3) any person investing “plan assets” of any plan, unless in each case the purchaser or holder is eligible for the exemptive relief available under one or more of the PTCEs listed above or another applicable similar exemption. Any purchaser or holder of the Notes or any interest in the Notes will be deemed to have represented by its purchase and holding of the Notes that it either (1) is not a plan or a plan asset entity and is not purchasing those Notes on behalf of or with “plan assets” of any plan or plan asset entity or (2) with respect to the purchase or holding, is eligible for the exemptive relief available under any of the PTCEs listed above or another applicable exemption. In addition, any purchaser or holder of the Notes or any interest in the Notes which is a non-ERISA arrangement will be deemed to have represented by its purchase and holding of the Notes that its purchase and holding will not violate the provisions of any similar law. Due to the complexity of these rules and the penalties that may be imposed upon persons involved in non-exempt prohibited transactions, it is important that fiduciaries or other persons considering purchasing the Notes on behalf of or with “plan assets” of any plan, plan asset entity or non-ERISA arrangement consult with their counsel regarding the availability of exemptive relief under any of the PTCEs listed above or any other applicable exemption, or the potential consequences of any purchase or holding under similar laws, as applicable. The net proceeds from the sale of the Notes will be used as described under “Use of Proceeds” in the accompanying prospectus and to hedge market risks of ML&Co. associated with its obligation to pay the monthly payments, Redemption Amount, Exchange Amount or Early Redemption Amount. MLPF&S has advised ML&Co. that it proposes initially to offer all or part of the Notes directly to the public on a fixed price basis at the offering prices set forth on the cover of this pricing supplement. After the initial public offering, the public offering prices may be changed. The obligations of MLPF&S are subject to certain conditions and it is committed to take and pay for all of the Notes if any are taken. ML&Co. has entered into an arrangement with one of its subsidiaries to hedge the market risks associated with ML&Co.’s obligation to pay the Redemption Amount, Exchange Amount or Early Redemption Amount, as applicable. In connection with this arrangement, this subsidiary will pay MLPF&S $.10 per unit as part of its underwriting fee. The Notes are ineligible assets in MLPF&S’ asset-based brokerage service Unlimited Advantage, which means that purchasers will not pay Unlimited Advantage annual asset-based fees on the Notes but will pay commissions on any secondary market purchases and sales of the Notes. In addition to the compensation paid at the time of the original sale of the Notes, MLPF&S will pay an additional amount on each anniversary of the Pricing Date from 2006 through 2009 to brokers whose clients purchased the units in the initial distribution and who continue to hold their Notes. This additional amount will equal 1% per unit based on the Redemption Amount of the Notes calculated as if the applicable anniversary of the Pricing Date was the stated maturity date. Also, MLPF&S may from time to time pay additional amounts to brokers whose clients purchased Notes in the secondary market and continue to hold those Notes. The consolidated financial statements, the related financial statement schedule, and management’s report on the effectiveness of internal control over financial reporting incorporated in this pricing supplement by reference from Merrill Lynch & Co., Inc.’s Annual Report on Form 10-K for the year ended December 31, 2004 have been audited by Deloitte & Touche LLP, an independent registered public accounting firm, as stated in their reports, which are incorporated herein by reference, and have been so incorporated in reliance upon the reports of such firm given upon their authority as experts in accounting and auditing. With respect to the unaudited interim condensed consolidated financial information for the three-month periods ended April 1, 2005 and March 26, 2004 and the three-month and six-month periods ended July 1, 2005 and June 25, 2004 which is incorporated herein by reference, Deloitte & Touche LLP, an independent registered public accounting firm, have applied limited procedures in accordance with the standards of the Public Company Accounting Oversight Board (United States) for reviews of such information. However, as stated in their reports included in Merrill Lynch & Co., Inc.’s Quarterly Reports on Form 10-Q for the quarters ended April 1, 2005 and July 1, 2005 and incorporated by reference herein, they did not audit and they do not express opinions on that interim financial information. Accordingly, the degree of reliance on their reports on such information should be restricted in light of the limited nature of the review procedures applied. Deloitte & Touche LLP are not subject to the liability provisions of Section 11 of the Securities Act of 1933 for their reports on the unaudited interim condensed consolidated financial information because those reports are not “reports” or a “part” of the registration statement prepared or certified by an accountant within the meaning of Sections 7 and 11 of the Act.